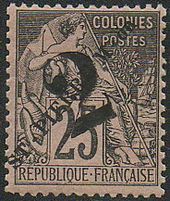 France is responsible for the defence of the islands. The Maritime Gendarmerie has maintained a patrol boat, the Fulmar, on the islands since 1997. Law enforcement in Saint Pierre and Miquelon is the responsibility of a branch of the French Gendarmerie Nationale. There are two police stations in the archipelago. ^ a b c Chisholm, Hugh, ed. (1922). 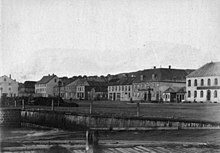 "St. Pierre and Miquelon" . Encyclopædia Britannica. 32 (12th ed.). London & New York. p. 344. Saint Pierre and Miquelon is a French overseas collectivity in the Western Hemisphere and the Northern Hemisphere. It consists of an island archipelago off the coast of Newfoundland near North America. The collectivity shares a maritime boundary with Canada. 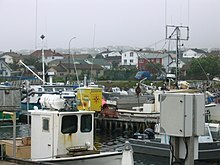 Miquelon-Langlade is the larger and less populated of the two communes (municipalities) making up the French overseas collectivity of Saint Pierre and Miquelon, located to the south of Newfoundland in the Gulf of St. Lawrence. It consists of three geological islands: Miquelon, Langlade and Le Cap, connected with tombolos. The communal seat is the settlement of Miquelon, on the northern tip, where the entire island's permanent population of 623 is located. Miquelon Airport provides flights to Montreal and to nearby Saint-Pierre. French America is the French-speaking community of people and their diaspora, notably those tracing back origins to New France, the early French colonization of the Americas. The Canadian province of Quebec is the centre of the community and is the point of origin of most of French America. It also includes communities in all provinces of Canada, Saint Pierre et Miquelon, Haiti, Saint Martin, Saint Barthélemy, Saint Lucia, Martinique, and Guadeloupe in the Caribbean; French Guiana in South America. Also there are minorities of French speakers in part of the United States, Dominica, Grenada and Trinidad and Tobago. 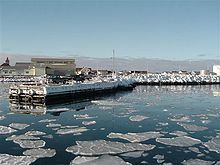 Saint-Pierre is the capital of the French overseas collectivity of Saint Pierre and Miquelon, off the coast of Newfoundland in Canada. Saint-Pierre is the more populated of the two communes (municipalities) making up Saint Pierre and Miquelon. 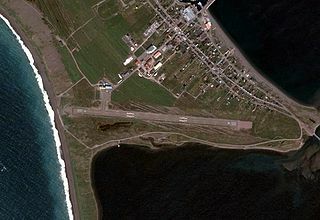 Miquelon Airport is a regional airport on Miquelon Island that the commune (municipality) of Miquelon-Langlade, in the French overseas community of Saint Pierre and Miquelon, off the eastern coast of Canada near Newfoundland. Green Island is a rocky island in the mouth of Fortune Bay, Newfoundland. It is located about 9.5 kilometres (5.9 mi) west of the Burin Peninsula of Newfoundland and 11 kilometres (6.8 mi) east of Langlade Island in Saint-Pierre and Miquelon. St. Pierre Cathedral is an early 20th-century church that served as the cathedral of the Roman Catholic Vicariate Apostolic of Iles Saint Pierre and Miquelon before it was dissolved in 2018. It is now part of the Roman Catholic Diocese of La Rochelle and Saintes. The church is located close to the harbour front of the capital city on the rue Jacques Cartier. Saint Pierre Island is one of the three main islands of Saint Pierre and Miquelon. It contains the town of Saint-Pierre, which lies on the island's east coast and is the main population centre of the island group. Miquelon also known as Grande Miquelon, is one of the islands of the archipelago of Saint Pierre and Miquelon, an Overseas collectivity of France located in the Atlantic Ocean, 22 kilometres (14 mi) south of the coast of Newfoundland. Miquelon is situated between Le Cap Island to the north and Langlade Island to the south. 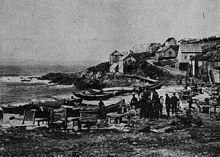 The following is an alphabetical list of topics related to the French territorial collectivity of Saint Pierre and Miquelon. While Saint Pierre and Miquelon has no railway, it has 114 km (71 mi) of highways plus 45 km (28 mi) of unpaved roads. Its only major harbour is at Saint-Pierre although there is a smaller harbour at Miquelon. 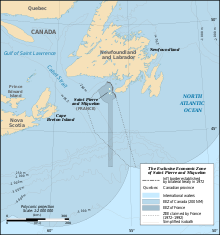 The dependency has no merchant marine and two airports; the runway at Saint-Pierre Airport is 1,800 metres (5,910 ft) long, and at Miquelon Airport, 1,000 metres (3,280 ft). 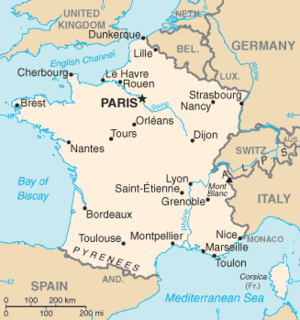 Below is a list of communes in France with a population over 20,000 at the 2013 census. All figures reflect INSEE's sans doubles comptes counting method.